Pastor George Bullock is the protégé of our late Pastor, Rev. Parnell Baxter who went home to be with the Lord October 8TH, 2008. Continuing the legacy of his predecessor, Pastor Bullock is a sincere man of God who is well versed in the Word of God and has been preaching for more than sixty years. He became a member of the Mt. Calvary Baptist Church in 1966 and at that time began to direct the church choirs, teach Sunday school, as well as the Sunday evening Young adult fellowship group. Under the able leadership of the late Pastor Parnell Baxter, he began teaching the Monday night Bible class in the early seventies, a class which he still teaches. Pastor Bullock relinquished the directorship of the music department to his son Rev. Edmund Bullock after about forty- one years of faithfully serving in that capacity. Also serving with his son is Nathan Sangster the organist, Deandre Bullock, Ola Brown and Alleyne Brown on the drums, and William Henderson on the bass. Pastor Bullock is an Ordained Minister and has been preaching for more than 60 years. He has a Masters Degree in Counseling and has authored one book entitled, New Beginning, New Character: Becoming the Person You Were Born to Be, published by Guardian Books in 2006. He also received certification in the Boston Public School system as a Social Studies and Physical Education teacher and Guidance Counselor. Along with his work in the church he continues the position as song writer and has written many songs for the church choir and for the Bullock Brothers gospel singers, the well-known group which he has been singing with for over sixty-five years. Pastor Bullock and his wife Sarah have been married for fifty-six years and have fourteen children, forty-seven grand children and fifteen great grand children. We honor Pastor George D. Bullock, Sr. in his new and exciting position as the Pastor of the Mt. Calvary Baptist Church for the past 10 years. Serving along with Pastor George is his blood brother, Rev. Richard Bullock who is the Assistant Pastor. He is also a protégé of Pastor Baxter and has served faithfully in the church for forty-five years. 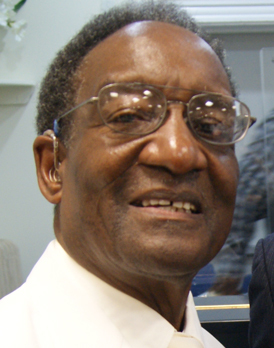 He also has been singing with the Bullock Brothers gospel singers for over sixty years.